Learn how to register for GST or HST in Canada. A2Z TAXCORP LLP is a boutique Indirect Tax firm having professionals from Multi disciplines which includes Goods and Services Tax (GST), Central Excise, Custom, Service Tax, VAT, DGFT, Foreign Trade Policy, SEZ, EOU, Export – Import Laws, Free Trade Policy etc. A2Z TAXCORP LLP is a professionally managed firm and having team of distinguished Chartered Accountants, Company Secretary, Lawyer, Corporate Financial Advisors and Tax consultants. 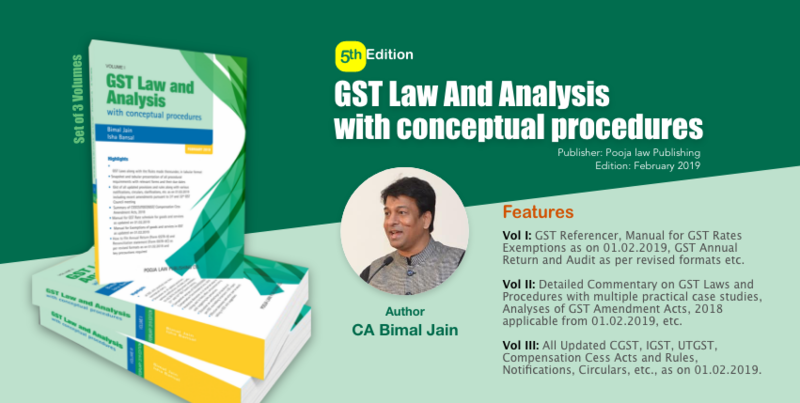 Latest Edition GST book “GST Law and Analysis with conceptual procedures” in 3 Volumes, updated as on 01.02.2019. Vol I: GST Referencer, Manual for GST Rates & Exemptions as on 01.02.2019, GST Annual Return and Audit as per revised formats etc. Vol II: Detailed Commentary on GST Laws and Procedures with multiple practical case studies, Discussion on all updated provisions and rules along with various notifications, circulars, clarifications, FAQs etc. as on 01.02.2019 including recent amendments pursuant to 31st and 32nd GST Council meeting, Analyses of GST Amendment Acts, 2018 applicable from 01.02.2019, etc. Vol III: All Updated CGST, IGST, UTGST, Compensation Cess Acts and Rules, Notifications, Circulars, Orders along with index of Press Release and various Forms & utility, etc., as on 01.02.2019. Enter your email address to free subscribe to this blog and receive notifications of new posts by email.